message once again, this time he commited his life to Christ, and to serve the starving. 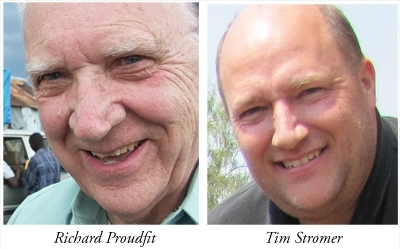 Tim Stromer has worked extensively with Richard for the past eight years, working as Director of Kids Against Hunger. One night while sleeping, a huge crash of thunder awoke him, and Tim heard the Lord say, “ You will be involved in a ministry that reaches farther, and farther, and farther.” (As the thunder continued to roll) Tim believes this is that ministry. Jesus Food is a Christian organization whose primary purpose is to provide fully nutritious food to impoverished children around the world, followed by giving them the opportunity to learn about the life saving gospel of Jesus Christ. Richard Proudfit saw a need and took action. With the help of compassionate people who have donated time and resources, he is seeing his vision come true. Now it's our vision, our time to feed. Help us.